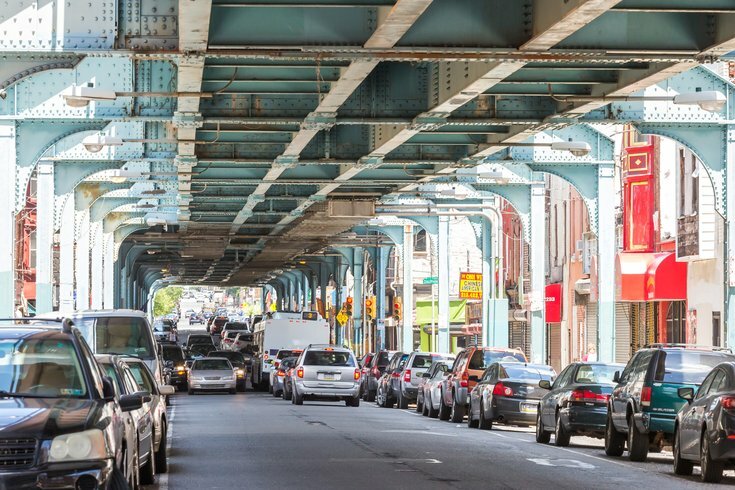 The elevated Market-Frankford Line on N. Front Street in Kensington. A multi-agency drug bust resulted in the arrest of 11 people allegedly associated with a distribution network in Kensington on Thursday morning, the Pennsylvania Attorney General's Office said. More than 160 agents and officers were involved in the "Kensington Initiative," a targeted attempt to bring down major criminal drug organizations in a neighborhood plagued with addiction and homelessness. Authorities executed search warrants on 13 homes and 15 vehicles on Thursday morning, seizing nearly $2 million worth of drugs. Agents recovered 983 grams of crack cocaine (street value of $98,000) and 4,900 grams of heroin and fentanyl (street value of $1.7 million) from an operation believed to distribute about $7.7 million in drugs annually, prosecutors said. Authorities said they also found three handguns, $13,000 in cash and a kilo press used for packaging drugs. Most of the heroin — about 170,000 doses — was sold on Argyle Street less than two blocks from the intersection of Kensington and Allegheny avenues. Drug packaging paraphernalia was largely found at a residence on the 6200 block of Cardiff Street in Northeast Philadelphia, officials said. Addresses for the suspects were not provided. Each will be charged with at least one count of charges including corrupt organizations, conspiracy, possession with internet to deliver narcotics and simple possession, authorities said.